drink | XKV8R: The Official Blog of Robert R. Cargill, Ph.D.
Thomas Kinkade. Photo by Monterey County Sheriff's Department, Monday, June 14, 2010.
thomas kinkade was arrested on suspicion of drunk driving. i wonder if his next series will be a bunch of blurry blue and red flashing lights? Thomas Kinkade, the artist known for his light-filled paintings of cottages, churches and country gardens, spent a night in jail after being arrested on suspicion of drunken driving. California Highway Patrol officials said Kinkade, 52, was pulled over outside Carmel and arrested just after 10 p.m. Friday. He was released Saturday morning, reports AP. According to the Monterey Herald, Kinkade was pulled over because his 2006 Mercedes-Benz didn’t have a front license plate. After detecting alcohol, the CHP was called and an officer gave Kinkade a field sobriety test, during which he “displayed signs of impairment.” Kinkade was arrested, then taken to Natividad Medical Center in Salinas, Calif., where his blood was drawn. 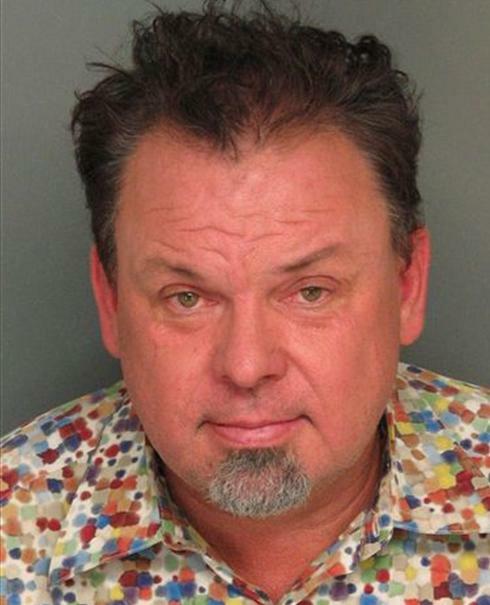 The report to determine Kinkade’s blood-alcohol content is pending.